Awards: Distinguished Honor, Military Writers Society of America, 2005. This accurate but fictionalized account of the Guadalcanal campaign of World War II is seen through the eyes of the Marines’ commanding general, his enemy counterpart, a tormented Navy nurse, and a Japanese dive-bomber pilot. But it’s mainly the story of a bright, lonesome young Marine from the American Midwest. It’s the first desperate, deadly battle in the South Pacific and the first time the Marines square off against the Japanese Army. “Places the reader on the front lines, taking cover in muddy foxholes, suffering with malaria, and facing a fanatical Japanese adversary…demonstrates an understanding of tactics and weaponry. 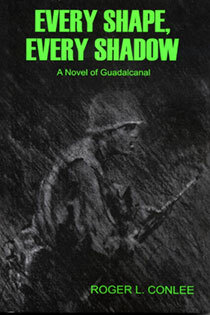 “Every Shape, Every Shadow is a must-read for veterans, particularly those of the Marine Corps and Army infantry, who will recall the sights, sounds and horror of face-to-face combat.